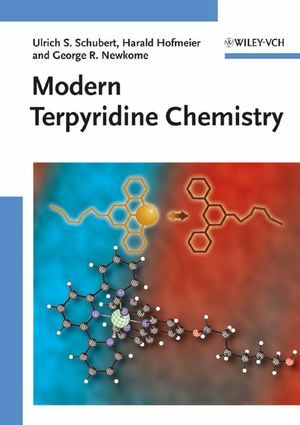 The first book to didactically illustrate this particular, prominent class of supramolecular building-blocks covers topics ranging from terpyridine syntheses, via their chemistry and properties, supramolecular structures, and multinuclear metal complexes, right up to functionalized polymers, 3D-architectures, and surfaces. Invaluable for students and lecturers in chemistry and biochemistry, materials scientists, as well as polymer, complex and physicochemists. Ulrich S. Schubert studied chemistry and biochemistry at the universities of Frankfurt and Bayreuth (both Germany) and Richmond, USA. He gained his PhD under the supervision of Professor Eisenbach (Bayreuth) and Professor Newkome (Florida, USA), and his lecturing qualification from Munich Technical University, Germany, in 1999. Since June 2000 he has been Professor for Macromolecular Chemistry and Nanoscience at the Eindhoven University of Technology in the Netherlands. His awards include the Heisenberg-Stipendium of the DFG, the Dozenten-Stipendium of the FCI and the VICI awarded by NWO. Professor Schubert's research interests mainly focus on tailor-made macromolecules, supramolecular polymers, combinatorial material research, organic heterocyclic chemistry and nanotechnology. Harald Hofmeier studied chemistry at Heidelberg University, Germany, receiving his diploma in 1999. In the same year, he started his PhD program at Munich Technical University, Germany, under the supervision of Professor Schubert. He received his PhD in 2004 from Eindhoven University of Technology, and is currently carrying out postdoctoral studies at Zurich University, Switzerland, where his research concerns the development of organic syntheses and processes in collaboration with industrial partners. George R. Newkome received his BS and PhD in chemistry from Kent State University. He joined Louisiana State University in 1968 becoming a full professor in 1978 and Distinguished Research Master in 1982. In 1986, he moved to the University of South Florida as Vice President for Research and Professor of Chemistry, becoming a Distinguished Research Professor in 1992. In 2001, he was appointed as Oelschlager Professor of Science & Technology at the University of Akron, where he is also Professor of Polymer Science and Chemistry, Vice President for Research, Dean of the Graduate School, and President of the University's Research Foundation. His research is currently focused on supra(macro)molecular chemistry, molecular assemblies (dendritic and fractal constructs), nanochemistry, inorganic-organic interfaces, molecular inclusion chemistry, molecular electronics, and photonics.